Democrat Conor Lamb, left, and Republican Rick Saccone were locked in a tight race in the special election for the 18th Congressional District in western Pennsylvania. The special election in the 18th Congressional District of western Pennsylvania – considered a bellwether for the midterm elections in November – is still too close to call. 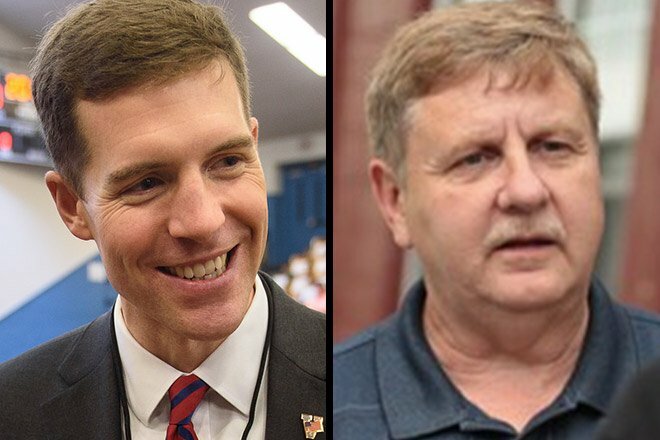 With 100 percent of the vote in, Democrat Conor Lamb, 33, holds a slight lead – less than 700 votes – over Republican state Rep. Rick Saccone, 60, with some absentee and provisional ballots still being counted, according to CNN. Lamb, a Marine veteran, told his Election Day crowd that voters had directed him to “do your job” in Washington, the Associated Press reported. “Mission accepted,” he declared. Earlier, Saccone told his own supporters, “It’s not over yet, we’re going to fight all the way, all the way to the end, we’ll never give up,” according to the wire service. In 2016, Trump carried the district by 20 points, but Saccone couldn't keep up with Lamb in the most populous part of the district – in southern Allegheny County. Saccone outpolled Lamb in Washington, Westmoreland and Greene counties. The election looks headed to a recount even though one is not automatic on the congressional district level in Pennsylvania, according to state law. But candidates can seek a recount within five days of counties completing their vote counts. There is little doubt that Saccone is an underwhelming candidate while Lamb is much stronger than Democrats are usually able to field in a district like this. But the fact that Donald Trump won it by 19.6 percentage points in 2016, and Mitt Romney beat President Obama by 17 points in 2012, means that even with a lousy candidate, Republicans should win this one. If Democrats pick this seat up, a lot of Republican House members sitting in districts that they have thought of as fairly safe may not be so safe after all. The victor will have to start campaigning for re-election almost immediately in a different district, after the state Supreme Court redrew Pennsylvania’s congressional boundaries, the AP reported.